When I attended a Lakeland product preview event this summer, the products that excited me most were the components that, together, form a cheese making kit. Sold separately, the recommended items are a large stainless steel maslin pan (though any similar large pan would be fine), a digital thermometer, two different cheese moulds, vegetarian rennet and some muslin squares. Lakeland also sell a recipe book called How To Make Soft Cheese. 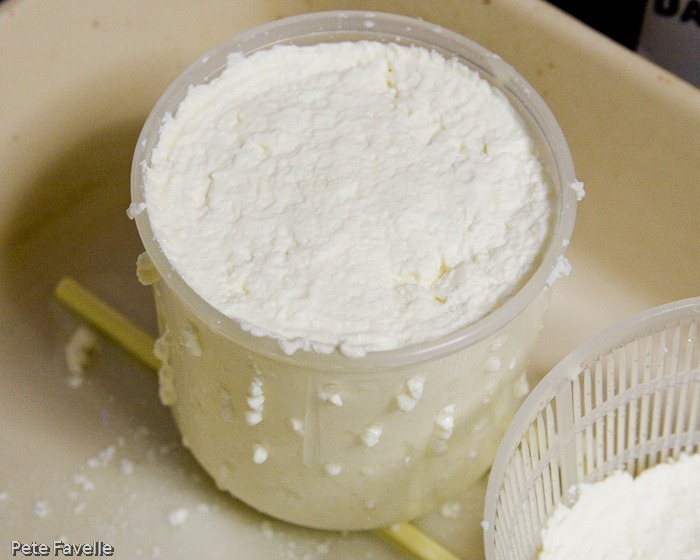 We recently received samples of the above items and Pete got to work making some cheese. 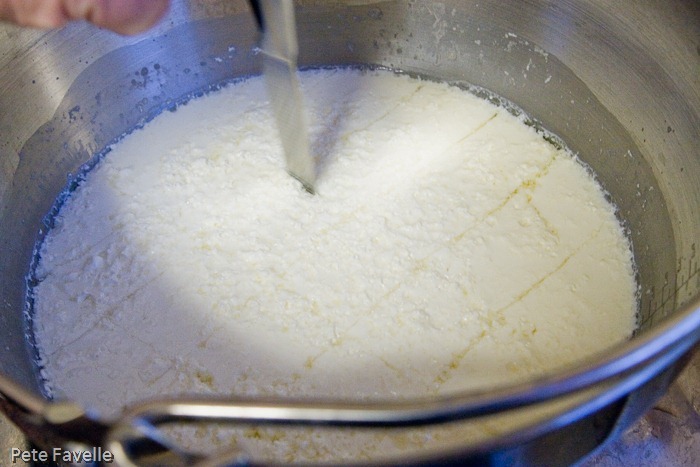 Not knowing anything about making cheese, I was initially drawn to by the Halloumi recipe, largely on the grounds that it sounded so simple. The ingredient list was pleasantly short too – milk and vinegar. The recipe instructed me to heat the milk to 95 degrees, add the vinegar and give the curd a few minutes to form before skimming off. 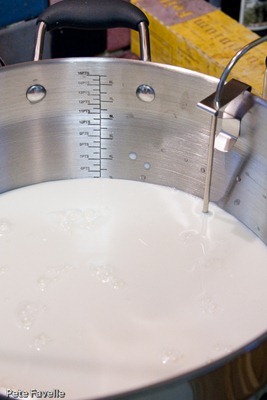 This first part was painless; the measures marked on the inside of the maslin pan made it easy to pour in the right quantity of milk without using a measuring jug and and the temperature probe, easily clipped to the side, worked like a dream. 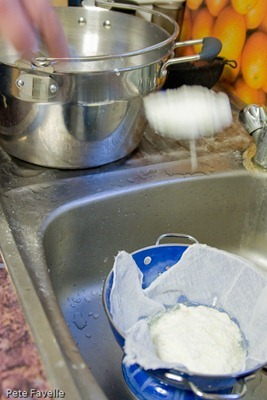 The curds themselves were wet, but easy enough to transfer to a colander lined with a muslin square. But the Lakeland’s muslin squares are the smallest I’ve ever seen and about half the size I’d like them to be. I’d suggest you buy larger pieces of muslin from another supplier, such as this Kitchen Craft Butter Muslin from Amazon. Once drained, the I spooned the curds into the mould – although the recipe ended up making slightly more curd than expected, so both moulds were pressed into service. I’d hoped, after all that, to be left with lovely, rubbery, aching-to-be-fried Halloumi, right? Wrong! What I’d made was crumbly cream cheese – perfectly tasty, but absolutely nothing like Halloumi. Clearly I’d done something seriously wrong, so a-Googling I went. It turns out that Halloumi is a not only more complicated than the recipe suggests (with additional heating steps that are entirely missing in the recipe), it’s also, and I’m quoting from Wikipedia here, “unusual in that no acid or acid-producing bacterium is used”. 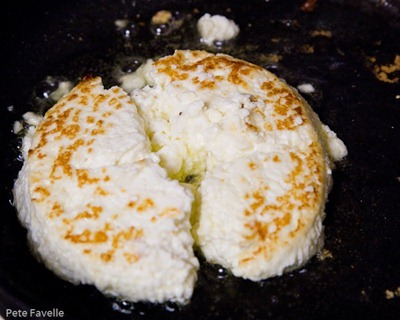 Halloumi is made using rennet, not vinegar, and is heated a second time after the curds have formed. 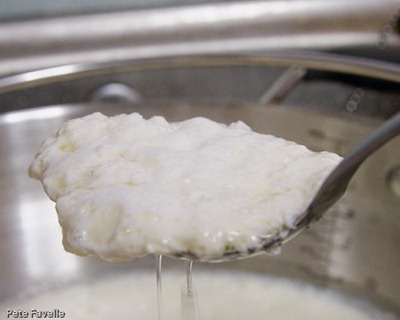 However the recipe in the book does have a lot in common with paneer cheese, as do the results. Paneer is usually made using vinegar or lemon juice in place of rennet and is strained and pressed once the curd has separated. Thinking perhaps that the recipe had simply been mis-titled, the next one I attempted was mozzarella, with Kavey there to assist. 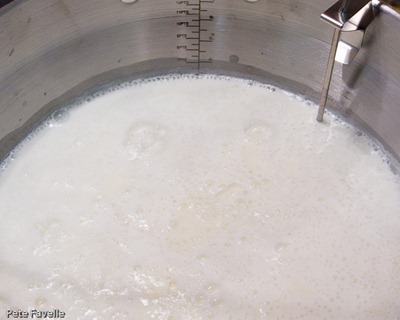 Once again the milk was heated – to only 32 degrees this time – before lemon juice and rennet were added. After 30 minutes, the curd had set reasonably firm and was ready to be cut and drained. A portion of the drained curd was then placed in a bowl and microwaved – the aim was to bring it up to 60 degrees, at which temperature it should magically have transformed into shiny, stretchy mozzarella which could then be kneaded and patted into shape. Well, no such luck for us. We tried heating it, re-heating it, overheating it and swearing at it. Despite our best efforts, all we achieved were soft, mushy, slightly grainy balls which tasted overwhelmingly of lemon juice. The whole exercise was fairly demoralising, especially as we measured the ingredients and followed the instructions on temperature scrupulously, before then trying to apply additional heat and still failing. 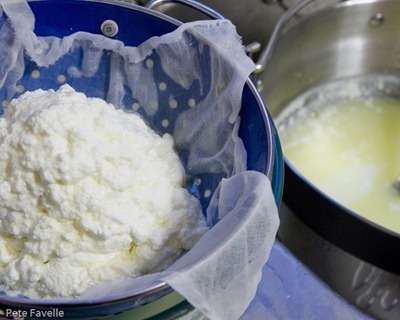 Again, we looked up other mozzarella recipes on the web afterwards and discovered that key elements of the method were missing from the recipe in the book; namely the second stage of heating the curds, still in the whey, before the last stage of heating as per the book. The actual kit, with the exception of the overly small muslin squares, is fantastic and very well made. The maslin pan, with internal measurements marked, is a delight and the digital thermometer quick and easy to use. The book, however, makes me wonder if anyone actually tried any of these recipes before it was published and is the one product I’d discourage you from buying. Assemble a kit of large pan, accurate and quick thermometer, rennet, moulds and muslin and source your recipes from the internet instead. 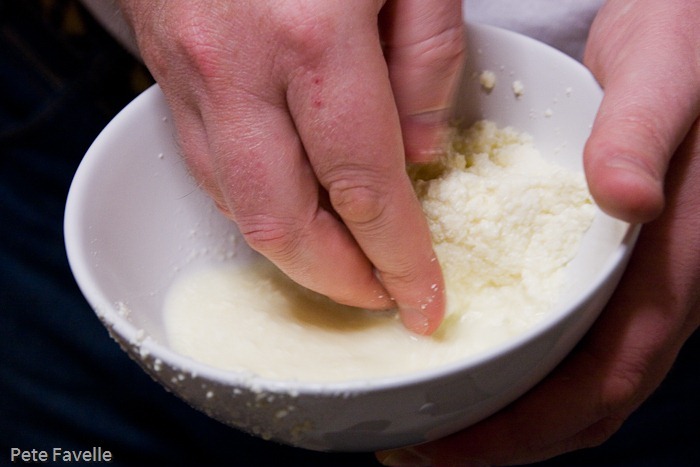 Despite our lack of success, we haven’t been put off cheese making and will be trying again with other recipes, very soon. Kavey Eats received samples of the cheese making equipment above from Lakeland. 6 Comments to "Lakeland’s Cheese Making Kit"
This is interesting Kavey – I nearly bought one of their cheese making kits the other day, but for some reason held off. I found similar problems with Lakeland’s pie maker when I bought it – the pie maker did it’s job ok, but the the instructions weren’t really clear, so I ended up learning with a bit of trial and error (and wasted lots of pastry) – of course, I can make lovely pies with it now! 😉 Great review, I found this really useful. Thanks Jo, glad it was useful. We thought the pan and moulds were excellent, and the rennet, though you can find that in Waitrose too. It’s a shame about the book, as it’ll likely put a lot of people off who think it’s them rather than poor instructions. I plan to try cheesemaking next yr too, will steer clear of their book! Yes, I would but the pan is fab! Golly! I hate it when you spend time on stuff and realise it isn’t working. I picked up the cheese making book at the Christmas press show but hadn’t got around to trying it myself although Helen FFF and Katie Feeding Boys spent a successful day trying the recipes and my understand was it all went off ok. 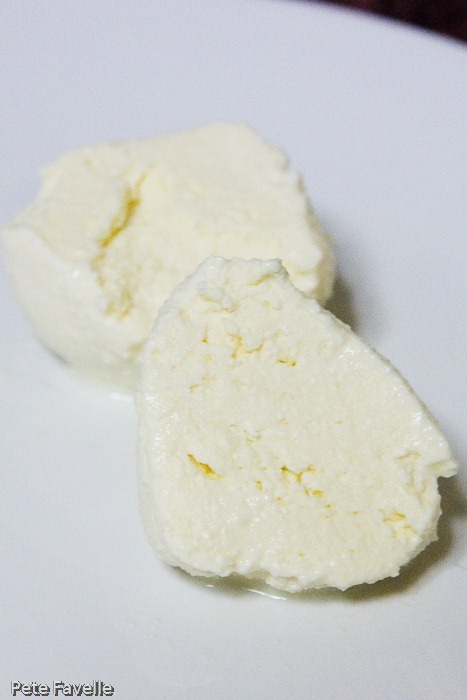 The only cheese I’ve made myself was paneer following Anjum Anand recipe which didn’t need any fancy kit or rennet.